Is it Time for Your Dental X-Rays? When most people think of x-rays, they think of the emergency room. X-rays are an imaging technology that allows a doctor to see what they can’t normally see with the naked eye. Of course that’s very helpful when it comes to diagnosing a broken bone, but x-rays’ only application isn’t reactive. X-rays are actually very helpful, proactive tools for dentists. 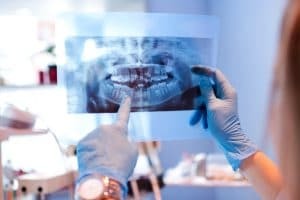 In the same way that a doctor can see bone structure with an x-ray, your dentist can get a comprehensive look at the structure of your teeth and jaw using this technology. Have you had your dental x-rays recently? X-ray technology has actually improved significantly in recent years. Digital x-rays allow your dentist to capture images and instantly display and evaluate them. This is a huge upgrade over traditional photography development processes. These new x-rays are not only faster, but they also emit 90% less radiation, making them safer as well. Some dental offices also offer 3D x-ray modeling. This is a process by which your dentist can construct an accurate, 3D rendering of your teeth and jaw by combining multiple x-ray images. This technology is useful for fabricating dental prosthetics. Preventive care is designed to save you time and money. With a tool like dental x-rays, your dentist can evaluate the growth and structure of your teeth. This lets him or her spot problems with cavities, malalignment, and malocclusion before these problems fully develop. You don’t want to deal with the repercussions of these problems later. The sooner you receive treatment for oral health issues, the quicker you can recover and move forward. The team at Greenhaven Family Dental is committed to providing an excellent experience for patients. Dr. Roberts and his team utilize digital dental x-rays and 3D x-rays to deliver first-class preventive dentistry care. If you haven’t had x-rays in some time, make your appointment for an evaluation today. You can schedule a biannual checkup and cleaning by contacting Greenhaven Family Dental in Baxter, MN at 218-454-0523.